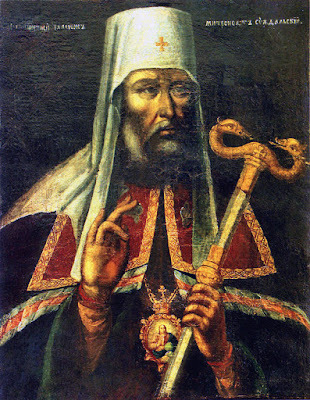 Saint Hilarion, Metropolitan of Suzdal and Yuriev (in the world John), was born November 13, 1631 into the family of the lower city priest Ananias. 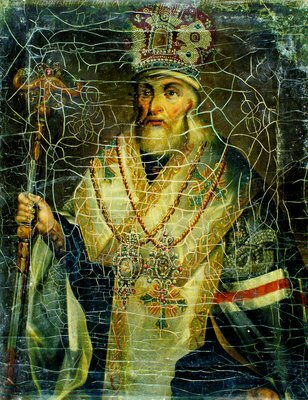 His father, famed for his piety and reading, was one of three candidates for the Patriarchal throne, together with the future Patriarch Nikon (1652-1658). John entered a monastery in 1653. 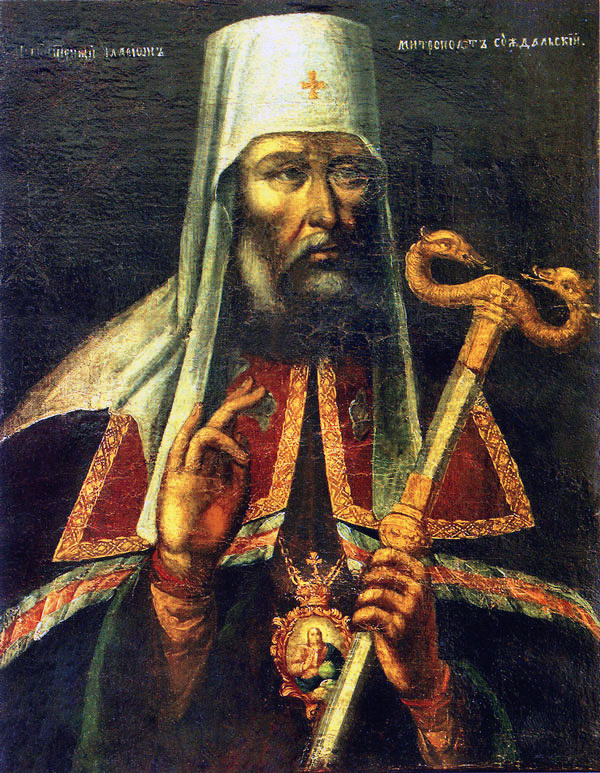 In 1655, he became founder and builder of the Phlorischev wilderness monastery not far from the city of Gorokhovetsa. In his monastic struggles, the saint wrestled with fleshly passions. When he fell down in exhaustion before the Vladimir Icon of the Mother of God beseeching Her help, the Mother of God shielded him with gracious power and calmed his spirit. 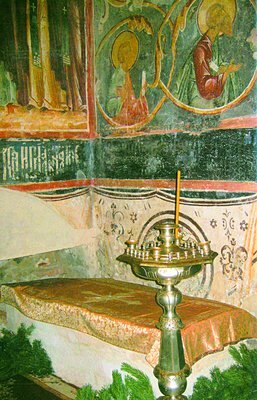 Once, when Saint Hilarion was serving Vespers together with a hierodeacon, robbers burst into the church. They killed the deacon and started to set Saint Hilarion on fire, asking him where the monastery treasure was hid. 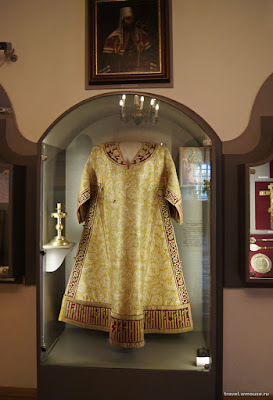 They did not believe that there was no gold in the monastery. Overcome by the pain, Saint Hilarion turned to the wonderworking icon and said, “O All-Pure Virgin Mary, Mother of our Lord Jesus Christ! If they injure me with the fire, I shall no longer have the ability to glorify Thy Son and Thee.” Suddenly the robbers heard the shouts of people searching for them, and they fled. Another time, Saint Hilarion in passing by the church heard a voice: “I shall glorify thee throughout all the land.” He trembled, and going into the vestibule, he found no people there. On the portico he found only the Vladimir Icon of the Mother of God. The ascetic fell down before the image with tears and confessed his unworthiness. Later on, when the saint had begun the construction of a stone church, he was very sad that concerns about the construction and disagreements among the workers were distracting him from prayer. While serving in church with the brethren, he was preoccupied by these thoughts and began to regret undertaking the work. With tears he besought the Mother of God not to abandon him and to deliver him from these worries. 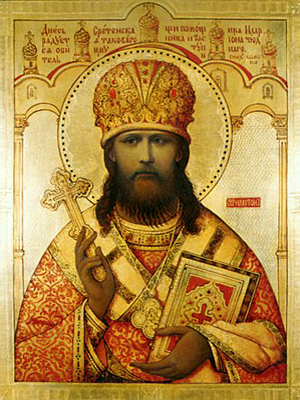 When he finished his prayer, Saint Hilarion remained alone in church and began again to think about the construction. And so he fell asleep. In a dream the Mother of God appeared to him and said, “Transfer My icon, named the Vladimir, from this hot church and put it in the newly-built stone church, and I shall be your Helper there”. Saint Hilarion awoke and ordered the large bell to be rung. The monks immediately assembled. All went to the hot church and, having prayed before the icon, solemnly transferred it from the portico into the temple. After serving the all night Vigil, Divine Liturgy and a Molieben, the saint told the brethren of his vision. Then in procession they transferred the icon to the church under construction, where they set it in the midst of the woods. From that time the construction went successfully and was soon completed. The saint wanted to dedicate the temple in honor of the icon, but he it was revealed to him in a vision that the temple was to be consecrated in honor of the Dormition of the Most Holy Theotokos. 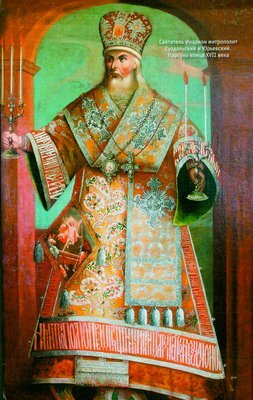 On December 11, 1681, the saint was consecrated as Archbishop of Suzdal and Yuriev, and in 1682 he was elevated to the dignity of Metropolitan and remained on the Suzda’ cathedra until February 1705. The saint died peacefully on December 14, 1708 and was buried in the Suzdal cathedral in honor of the Nativity of the Most Holy Theotokos. The saint was known for his unceasing concern for the poor. After his death they found only three coins. The wonderworking Icon of the Mother of God of Vladimir-Phlorischev (August 26) was painted by the renowned iconographer John Chirov in 1464 at Nizhni Novgorod in fulfillment of a vow of John Vetoshnikov.